Reading Edward Hoagland, accomplished naturalist and writer, or rather, losing oneself in Hoagland’s muscular and multitasking prose, one is quickly convinced that the only reliable way to depict a place is by the written word. 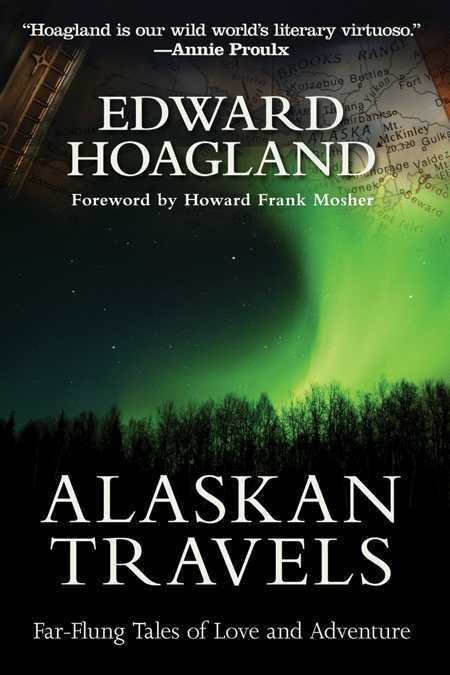 Alaskan Travels is Hoagland’s account of 1980s Alaska, as he experienced it in the company of his love, a nurse named Linda. Linda is responsible for the state’s TB care, and she travels by bush plane to remote villages and hunting camps to test and monitor patients, dispensing medical care as needed along the way. Her role provides cover for Hoagland, and he makes the most of it, camping on schoolroom floors with her, watching dog races, and conversing with everyone: Inuit, Indians, hunters, Russian Orthodox priests, biologists, and merchants. He interviews developer millionaires and witnesses Linda’s quiet conversations with elderly Indians who are dying of liver cancer in remote cabins far from medical care, but with a view of the tundra and the northern lights. The result is painterly, rich, a multisensory awareness of a culture’s varied historical and cultural components. It’s not a static portrait; Hoagland is alert to the impacts of change and the vortex of oil boom money on people, animals, and landscape. He records it close up, recounting the desperate jailbreak, flight, and eventual rescue of an eighteen-year-old Indian named Amos, and at a societal level, noting the epidemic of suicide among young native men caught between old ways and their probable failures in the new economic landscape. Hoagland is a necessary part of every public library, and the private libraries of lovers of travel, nature writing, and stimulating prose.